I can't imagine anything more lovely than being wrapped up in the most romantic proposal in literature. Aside from being wrapped up in Colin Firth, of course. Do you remember the Mr Darcy mug we wrote about? 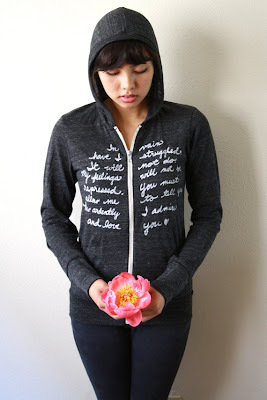 This Mr Darcy hoodie is a little like that, but snugglier and much more romantic. It's by Neena Creates on Etsy and so very snuggly that I'm recommending it even though it will have to come aaaaall the way from the US. Luckily, it's not actually very expensive, despite being hand-printed and needing shipping. It's about £27 and £4 delivery, but obviously you might get a sneaky customs charge on top of that. Customs aren't really known for their love of romantic literature. It appears to have sold out just this second, but as is often the way with Etsy listings, it's very likely to be relisted soon - just pop Neena a message if you'd like it immediately, or check out her Darcy quote tank tops. This 2nd proposal t-shirt is pretty cool as well. Not quite as cosy, but still very lovely. Yeah, I'm going to need either Colin or this hoodie in the post. I don't think Etsy sell Mr Firth. So gorgeous. I love the heart-shaped proposal t-shirt in her shop - the Robert Frost one is lovely too! I don't even particularly like Pride and Prejudice. And yet, I really do like Colin Firth. That scene is divine. Swoon! I wish I could make a man so distracted as this! Just lovely.